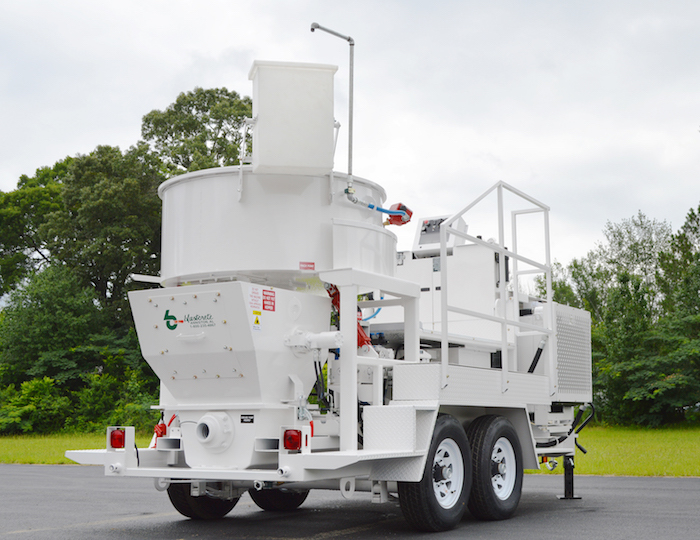 The new MX-20MT mixer/pump from Blastcrete Equipment Company gives contractors a high-output, easy-to-use unit for superb productivity on shotcrete and refractory work in a variety of applications, including steel mills, cement plants and petrochemical plants. The machine provides twice the output of the company’s popular MX-10 mixer/pump yet has nearly the same compact footprint. It’s mounted to a single-chassis trailer for convenience as well as fast and easy transportation, setup and cleaning. Portability on industrial jobsites can come at a premium. The ability to move and set up a unit in tight spaces using a forklift can be essential. The MX-20MT can be set up with a single person, which saves labor and time. The MX-20MT features electric braking and lights for enhanced safety when travelling. Lifting eyes on the platform allow operators to use a crane to lift the machine and place it on a flatbed for travelling longer distances. Blastcrete offers the MX-20MT with an optional skid-mounted framework that reduces the overall length, width and height of the machine.